StopTech® introduces a new line of StopTech® Racing Friction Materials that brings the company’s “Brake Late, Finish First” philosophy to a wide range of racing disciplines. The pads complement the company’s wide range of high performance and replacement brake friction. The new race-specific pads are engineered to provide optimal friction levels for shorter stops, increased control through superior pedal modulation, and fade-free performance at extreme racing temperatures. 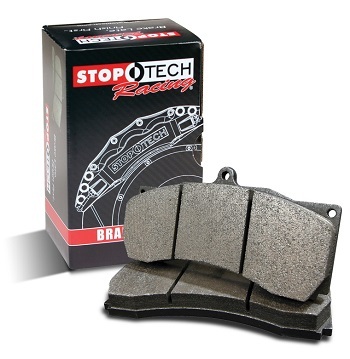 StopTech® Racing pads are designed to provide superior performance in any racing brake system and engineered to match the outstanding performance capabilities expected of all StopTech® Racing Balanced Brake Systems. StopTech's® unique metallic compounds are blended with carbon and graphite particles to provide an optimal high temperature race friction material. The result is smoother, more predictable and more consistent brake engagement along with exceptional release characteristics not found in most other racing friction materials. StopTech® engineers work directly with race teams, often track-side, to gather valuable experience in dynamic real world conditions. Data is immediately integrated into the research and development process, resulting in optimized brake systems for individual racing programs.